So yummy! If you want a change of pace that’s meat-free, yet full of protein, fiber, and very filling…this might be for you. I like it with Tzatziki on top (my recipe is in this post), or a little “fry sauce” (what some drive-ins call that wonderful mayo/ketchup combo), and with a thick slice of tomato, avocado, onion and lettuce, as a burger should be, it’s fab. Don’t be afraid of Quinoa. It cooks just like rice – might even be a little easier! – and can be subbed almost straight across in most recipes. 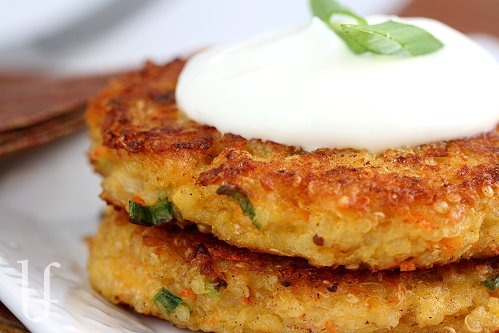 I made Rice Burgers for my kids for years and this is the same recipe, with Quinoa instead.